Dutch MDC [Lost in the] Magic Forest finished developing an island on the Second Life Teen Grid for the Waag Society a little while ago. As I don't have TG clearance it took some time before I picked up this story. The Waag Society is an organisation which started in 1994 as 'Society for old and new Media', de Waag'. Founders were Caroline Nevejan and Marleen Stikker, who is still Waag Society's director. Before, Stikker was the mayor of the Digital City, the first internet community in the Netherlands. 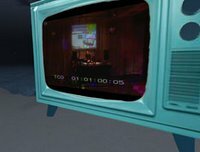 The Society's -soon to be called 'Waag Society'- mission was to make new media available for groups of people that have little access to computers and internet, thus increasing their quality of living. After a complete restauration of the Waag building, a small group of enthousiastic idealists began their activities in 1996. 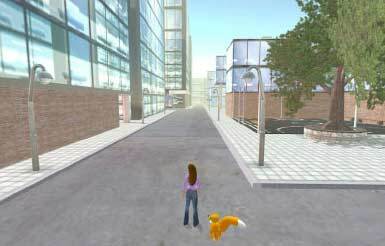 The island in Second Life (TG) is called Self City and is an educational project to experiment with new teaching methods for pupils with special needs in the age of 12-14. It is about students which cannot function properly in a normal classroom, often through social emotional or light mental handicaps. 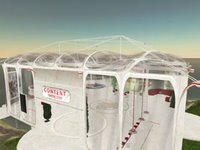 "We developed a complete city on the island with a movietheatre, (fake)gambling hall, basketballcourt and a Heads Up Display (HUD) to assist the pupils in their interaction (see screenshots). 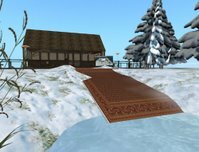 The scientific findings of the new teaching method in Second Life have been gathered in this report (Dutch only): Research Report Self City"
happened so close to Christmas. While it is not known at this time exactly why the layoffs occurred, Jeremy speculates that they will be focusing on technology like OnRez. Joel Greenberg, whose job status is unknown at this time, announced on Twitter that ESC is shutting down their virtual ad network project. 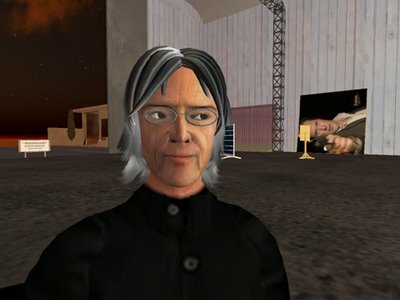 In a prophetic blog entry written last week by Rez Menoptra, he speculated on how long builds will last in virtual worlds and who will remember them. Massively will update you with the latest news on this topic as we hear it. Stay tuned! Most of these people we will never know, but we've seen Jeremy himself move away from the Sheep earlier this year as well as Jerry Paffendorf. 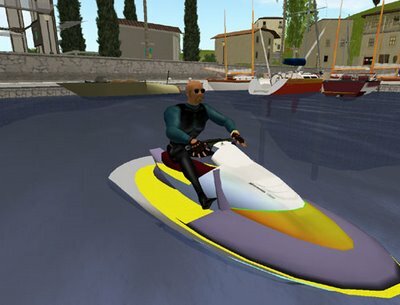 Is the negative trend for Second Life we've seen in Europe now crossing to the US as well? Are we close to a dotcom-burst in the virtual world industry? I don't think so. 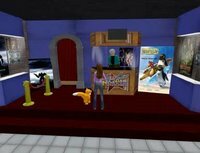 In november I quickly mentioned AOL's departure from Second Life, now Pontiac is joining the list of departing companies. How should we read these signs: Is it true that Second Life has proved itself unfit for business? In the case of Pontiac / Motorati I think it surely didn't. It is a moving business we're in. The past year has seen an extreme usergrowth in Second Life, and an enormous commercial / PR drive for companies to enter virtual worlds. Now it's time to check the balance. All in all, as I wrote in my previous blogpost on the Millions of Us venue for Splenda; "It's Dozens of Them" meaning right now it's just too much of the same. We're creating presence for companies. There's an occasional immersion that goes beyond simple presence and really adds something to the industry. Millions of Us, Lost in the Magic Forest, Electric Sheep Company, Virtual Italian Parks, and many many other MDC's have mastered the skill of building in Second Life. What they haven't got is the skill of Business Analysis. 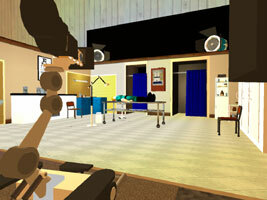 It will take skilled consultants to translate core business to virtual representations. It will take experience and time for us to be able to build virtual venues that are fit for business and will form an extention to our daily operations. 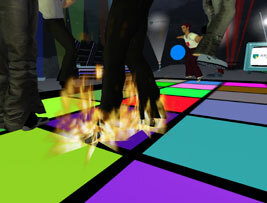 2007 has been a year in which Second Life and virtual worlds have been a toy for marketing and communication departments, 2008 will probably see NVE's as a playhouse for IT departments and 2009 will probably be the year in which the NVE potential really sinks in, the time when the Business takes over and will use it as a medium for its core processes. In a time when global warming and major climate changes are the talk of the town, Dutch insurance company Aegon (one of the biggest insurance companies in the world) comes with a good old Dutch winterscene. The island is dominated by the flat fields of the Netherlands with frozen streams. The scenerty reminded me of the legendary 'Eleven City Tour' a 200 Km long skate tour which was last held in 1997 (it's been so long since then we have had enough ice). Due to the requirement that along the route the ice needs a minimum thickness of 15 cm. it's only been held 15 times since 1909. When it's on though, it's a national holiday. The second picture reminds me of the Bridge of Bartlehiem (a tiny village a.k.a. Bethlehem in Frisia, which the tour passes two times en route to Dokkum and back to the finish at Leeuwarden). It's almost impossible to have a guaranteed thickness of 15 cm. everywhere on the track, and especially under the bridges the ice grows slowly. To safeguard the over 15.000 skaters that usually participate there are occasional 'kluning points' where skaters have to pass a bridge on the road. These parts are usually carpeted so the skating irons don't get blunt. But alas, that's ancient history now. Let's concentrate on speedskating. And so does Aegon, who's been sponsoring a Dutch speedskating team for ages. 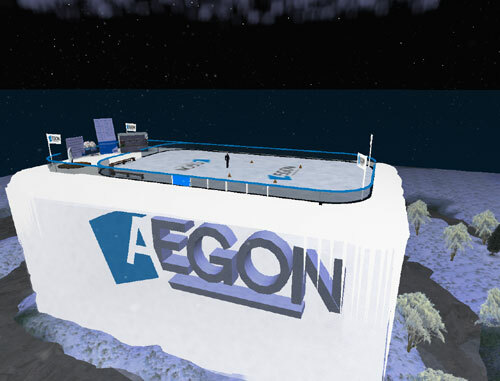 The center of the sim contains a mega iceblock which holds the Aegon logo. On top of it, there's a speedskating ring. At the side of the ring you'll find this seasons speedskating calender and you can buy (~! @#$%^) skates for L$ 900 and try it out. Get outta here, I like freebies! Early april I went to a seminar on Second Life in the Netherlands. Today I missed out on the next big thing in the Netherlands, the Second Life seminar organised by Euroform. Fortunately I received some good updates while I was working hard on a RL thing for a change. It seems I haven't missed too much as there were several speakers present who were also present at the april session (like the University of Amsterdam and Dutch Stock Exchange) and the guys from Lost in the Magic Forrest were again. I've probably missed out on a few interesting stories from speakers from Adformatie, Ymerce and Essent. The one thing remarkable is that for the second time in a row, Justin Bovington, CEO of Rivers Run Red failed to appear. There have been many people wanting to hear him, and paying a lot of money to do say, who didn't leave satisfied today. These sort of misfires spread quicly in the SL community making several large Dutch companies switching to local content developers. 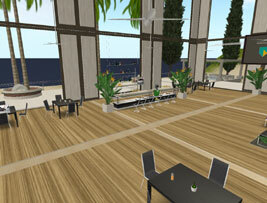 Friday the 8th wil see the launch of a new ABN AMRO venture in Second Life; the Young Professional Island. 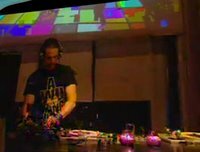 The opening will be supported by DJ Jesse Voorn, ambassador to Dance4Life with a simulcast or cross-reality concert from the Panama Club in Amsterdam . 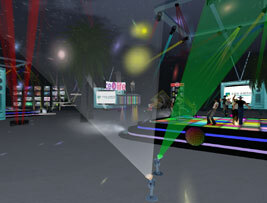 In this coop ABN and Dance4Life are opening an island for people at the start of their careers. It will be a place to meet, socialize and relax. The Dutch bankers will organise several events for the community. 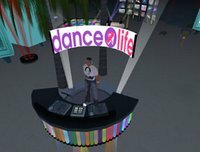 The island is one of the new builds from the Dutch Lost in the Magic Forest and the Dance4Live club on the island is build by ABN AMRO themselves. 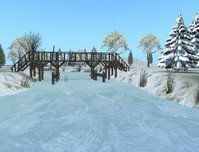 According to Lost in the Magic Forrerst the build is not complete yet, but will be further developed in coop with the YP community. DJ Jesse Voorn will perform between 00.00 and 01.00 (CET) in both Club Panama as well as Second Life. 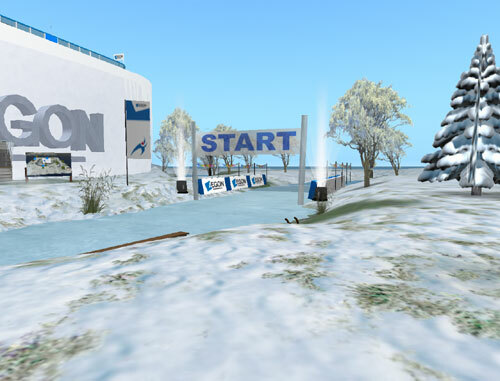 Jesse is no stranger to Second Life, as he has done a rather succesfull gig earlier this year. Dance4Life is an international organisation which gets young people together in the fight against hiv and aids. Dance is the international language that binds young people all over the world. Dancing is combined with television programmes, media campaigns and fundraising to benefit projects in areas that suffer strongly under the presence of hiv and aids. Today the Design Corp Brain Gaime (with clients like BNN) has been taken over by Lost in the Magic Forrest due to rising demand in design expertise. The Magic Forresters have been working hard on succesful immersions like Nextstrategy, Essent, Talpa and Content. 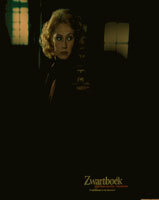 And yay.. it's another Lost in the Magic Forest production. Rotterdam, 26 April 2007 - Dutch employment agency Content goes Second Life. Dutch employment agency Content, one of the biggest in Europe, opened an island in Second Life. Content sees Second Life as an important platform for dialogue and crowdsourcing. 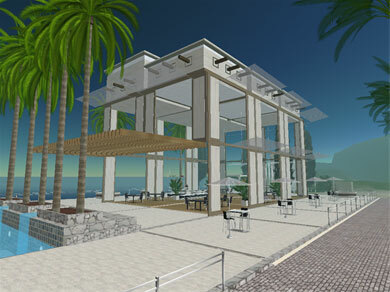 Furthermore, Content will offer both real jobs as well as Second Life jobs on the island. Virtual branding agency [Lost in the] Magic Forest was responsible for the design, working closely together with internet agency Evident. Despite a major buzz about being taken over by RTL media, Talpa, or TV 10 or whatever, is setting up its next SL event. The ultrashort IMDB description of the movie: "Set during the end of WWII, Black Book is the story of a Dutch Jewish girl who narrowly survives the war in Holland. She joins the resistance to find out who betrayed her family after all of them were killed in an attempt to reach the liberated south." Even artlovers don't have to leave their pc's anymore if they want to go to the museum. 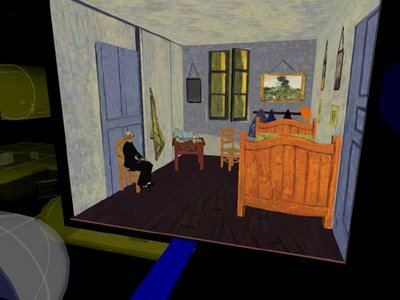 Raceman Dal took the initiative for a virtual van Gogh exposition; "Virtual Starry Night - Vincent van Gogh's Second Life"
The exposition is a great build, having three alternate routes; landscapes, portraits and stills. 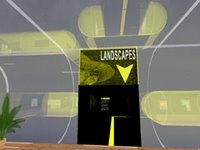 The virtual paintings give info about the original and in which museum they can be found. 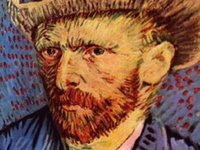 Top attraction is the painting below, which is a virtual reproduction. Visitors can walk into this painting. Second Life's an excellent medium for cultural expression, I can't wait to see a reproduction of Rembrand's famous Night Watch. Some of my foreign friends are getting tired of all those new Dutch companies entering SL. It appears that the Dutch are early adapters in Second Life. Right now the Netherlands is one of the most represented countries in this virtual world. The leading SL builders in the NL are [ Lost in the ] Magic Forest and Damanicorp. DMA is starting to gain momentum as producer of Streaming Media in SL. Wednesday April 4th the Dutch Media Conference Center, Media Plaza, organised a seminar on Second Life, talking about doing your homework! Indeed, wednesday, worldwide Second Life patch day! 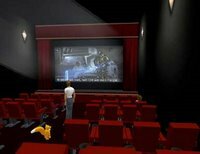 Live streaming video in Second Life door Ivo Krupinski, DMAEen aantal locaties waar (live)streaming video in Second Life plaatsvindt passeren de revue. De DMA-Studio, muziekevenementen, zakelijke bijeenkomsten en een locatie waar onderwijs centraal staat. Sogeti was well represented at this event with about 7 employees, leaving the poor lonesome junior of Cap Gemini wondring if he should have looked for a different employer. 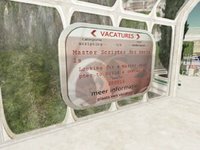 One of the most obvious things to do on Second Life is job recruitment. Be a hip company and show it by your SL Presence. No wonder agencies like Randstad are planning to go Virtual. However, it is not the job agencies that are among the first to try this new medium for recruitment. In the Netherlands, one of the first is the energy company Essent. 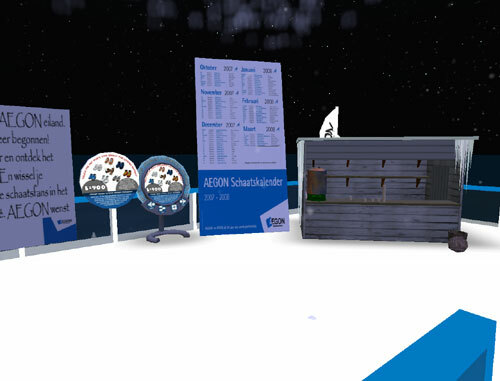 Their sim was eventbased and designed for the Nationale Carrierebeurs in the Amsterdam Rai (9-10 march 2007) and built by [Lost in the] Magic Forest. The event and SL presence were a success, they received quite a number of applicants through SL. Well, the Talpa launch (on February 9th) was an event! 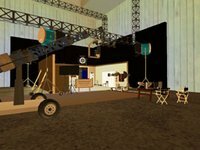 For the grand opening of the Talpa Dropzone sims a stage was set up where the band 16-down performed in SL -or not? 16-Down actually performed live on stage in Paradiso (Amsterdam) and the concert was live-streamed to SL and vice-versa. 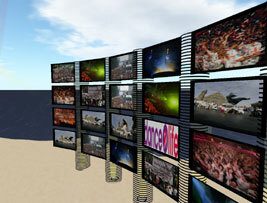 Visitors of the actual concert could watch the virtual crowd dance to the beat as well. The Talpa website names it a cross-reality concert. The Dropzone, aptly named of course, since one really does drop in after a teleport, is created with the help of [Lost in the] Magic Forest.